Leading-edge software has the capability to easily communicate with others to provide the ability to transfer data back and forth easily. We recognize you have invested in various fleet management tools and our software will help you take full advantage of each one of them. 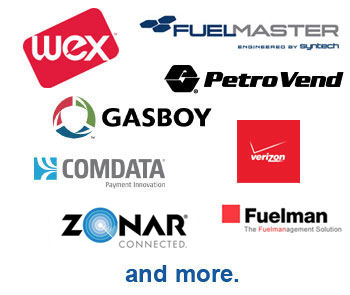 Collective Data software integrates with many leading fuel card providers, GPS systems, accounting software, and more. Import your fuel card transaction data directly into collectiveFleet®. Our fuel card data imports improve fuel tracking leading to greater vehicle efficiency. Basic fuel tracking comes standard in our software system enhancing accuracy, speed, and the efficiency of getting that information to you. Obtain accurate meter readings to improve maintenance schedules and miles per gallon statistics. Improve your ROI by integrating GPS or diagnostics data with Collective Data’s fleet management software. Our software integrates with most GPS providers that make their information accessible from third party software solutions. Ask us about integrating with your GPS or Diagnostics provider. Improve your system for pre-and-post trip inspections that address regulatory compliance and safety. We offer a pre-built seamless integration that provides automatic maintenance requests for equipment that does not pass inspection. Making inspections mandatory can be crucial for spotting maintenance and safety issues early. By combining the power of the Zonar and EVIR systems with our fleet management software, you will have a solution that verifies inspections and automatically inputs the data into your fleet software package for powerful analysis. Ask us about Zonar Integration.